Choosing your wedding ring is one of the biggest decisions to be made with your partner whilst planning your wedding; after all it’s going to be the one thing that will stay with you for the rest of your life and symbolises your marriage on a daily basis. Hopefully this post will help you in your decision making process of finding your perfect wedding rings! A lot of brides and grooms opt for a traditional plain wedding band. For brides many engagement rings will have a slightly raised stone(s) for a straight ring to fit perfectly next to it. Others diamonds will be set lower, meaning you will need a shaped wedding ring. Plain rings generally come in a range of metals, including precious metals like platinum, white gold and rose gold or alternative alloys like titanium and zirconium. The rings will also come in a variety of widths, the majority of rings are between 2mm and 10mm wide; the width can affect the comfort of the ring, and even the size needed. Different profiles are also available and a number of different finishes, the word ‘profile’ refers to the shape you’d see if the ring was viewed as a cross-section. 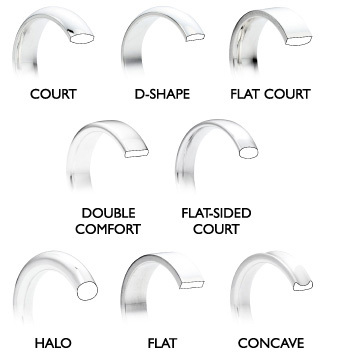 If you are looking for a plain wedding ring you will be able to select your preferred profile, for example a court or flat profile. If the diamond in your engagement is set quite low you may decide to go down the shaped wedding ring route, so your wedding ring fits perfectly next to your engagement ring. You may also want to add a bit of sparkle to your shaped ring by opting for diamonds to be set in the band. Diamond-set wedding rings are also a popular choice, mainly for brides but some men do like a little sparkle too! Different cuts of diamond wedding rings include brilliant cut diamonds (round), princess cut diamonds (square) and fancy cut diamonds. ‘Fancy cut’ is a term used to describe emerald cut (rectangle with the corners missing), marquise cut, baguette cut (rectangle), heart shaped diamonds and anything else out of the ordinary. A diamond-set wedding ring can also really enhance and compliment your engagement ring. If you can’t decide which metal to choose, don’t worry! There are two metal or multi metal ring styles available so you can have the best of both worlds! These rings are made by pressing two separate bands together using a process called cintering. This can only be done using specialist equipment under carefully monitored conditions. The different colours of metals, for example platinum and rose gold can look lovely together; giving you a perfect ring to last a lifetime. If you are looking for something unique there are a lot of unusual wedding ring styles available. Decorative wedding rings involve precision cut designs and there are some very modern and intriguing designs to choose from. Wooden inlay rings are a unique choice, especially for the groom! With recycled wood no two grains are the same so each handmade ring is totally unique and comes with its own story! Ceramic and stack ring are another recent trend for brides or grooms looking for a completely alternative style.